"I think of how, within the last two weeks, there's a new decree from Rome condemning women who have in any way participated in ordination of women, Instead of listening to what's happening in the world around us, and instead of accepting the fact that there's nowhere in the gospels that says women can't be ordained; instead of listening to women and why they want to enter into roles of servant leadership in the church, we condemn them, excommunicate them. I think that's wrong, very wrong, if you take into consideration the way Jesus was... "
This quote is from a homily given at St. Hilary Parish in Redford, Mi. Visit NCRcafe.org for free downloads of Bishop Gumbleton's homilies. Note: Bishop Gumbleton's brother Jerry and sister-in-law Marion attend Mary, Mother of Jesus House Church in Sarasota, Florida. 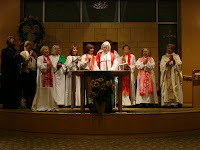 Thank you to Ann Rodgers for her article on May 31, Vatican moves against ordination of women. As a Roman Catholic Womanpriest, I have received many phone calls and e-mails of concern and support. This is a time of transition in the Catholic Church, a time of optimism, but also of justified anger. Anger because women in the Middle East are stoned for violating Islamic law; brides in India are burned for dowry; girls in Africa are genitally mutilated; women in war-torn countries are impregnated by enemy soldiers; and females in China are aborted simply because they are female. Around the world wives are beaten by their husbands; female children are sexually abused by their fathers, uncles, brothers; women of all ages are raped and murdered. Single mothers are abandoned by the fathers of their children; hard-working women are unfairly paid; many females are denied education; and women in my Church have no voice. Anger because the all male clergy have pronounced excommunication for women daring to be ordained to the priesthood, but there is no excommunication of Catholics committing crimes of violence against women. The refusal of the Church to treat women as equals makes women in society vulnerable to violence in all its forms. The Church must affirm that a woman is holy, is a full human being made in the image of God, and can image Christ in the priesthood. 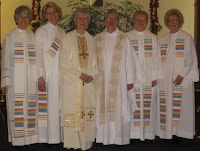 To affirm this, in justice, the all male clergy must ordain women. Toni Tortorilla is in the middle, Suzanne Thiel is on the right and Ruth Broeski is on the left. "I believe in the supremacy of conscience, and my conscience has led me all along to be an ordained Roman Catholic priest," Tortorilla said last week. She, too, rejects the excommunication decree and says she will continue to serve her growing community. Archaeological and historical evidence, she says, supports the view that women have been priests and bishops in the Catholic Church. "The Holy Spirit's call to be a priest is very strong and very persistent," she said. "It supercedes the Vatican's determination not to ordain women." This is Portland's second ordination at the Zion United Church of Christ, Gresham, Oregon (suburb of Portland). Pastor Dennis Alger and congregation have been very welcoming so gracious and supportive in allowing RCWP to hold a second ordination at their church at no cost....This June 7th ordination is the first public ceremony presided by new American womenbishop, Dana Reynolds from Carmel, California180 people attended---of all ages---well received---joyous enthusiastic loud participatory singing of the litany of saints---obvious acceptance from the people---tears and applause and many many smiles... reception put on by CTA of Oregon membersPicture shows newly ordained priest, Ruth Broeski of Portland and deacon Sandra DeMaster from McMinnville, Oregon and RCWP priests,Suzanne Thiel from Portland and Juanita Cordero from Los Gatos, California.